Another Experiment By Women Film Festival (AXWFF), the screening series curated by Lili White, will be hosting their 6th event as part of New Filmmakers at the Anthology Film Archives in New York City. The theme of this screening is “Body Hot” and several of the films deal with issues of physical existence. 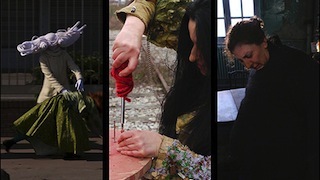 Some of the films screening include Ursula Sommer’s Heartbeat, which deals with the filmmaker modifying the speed of her heart rate; Leila Jarman’s experimental dance film Upbeat Nothing-ness; Nicola Walkerden’s meditation on the human spine Cinamnesia; two films by curator Lili White, I Snake-Foot and For Sally; and more. Image below from Cornelia Eichhorn’s Ved’ma, courtesy of the AXWFF website.